Topic: update 20-05: A.D.Publishing 40% SALE! Re: update 20-05: A.D.Publishing 40% SALE! Topic: Prototype Klingon paint schemes. 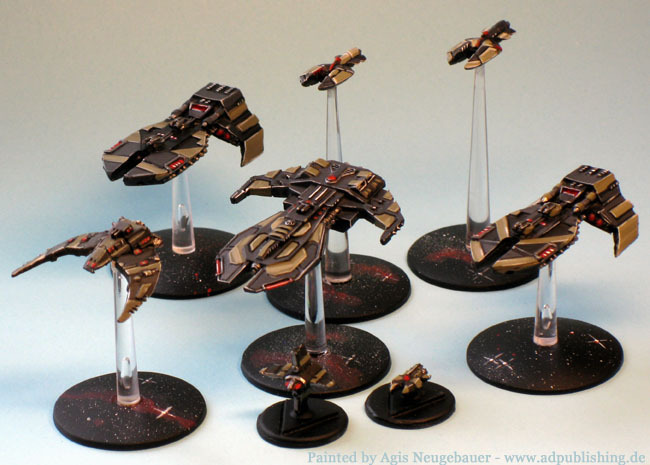 Re: Prototype Klingon paint schemes. Exactly the way I envision Klingons! Re: update 12-15: A.D.Publishing SALE! basaint wrote: Its been awhile but I'd go with ruling you pointed out. 'any one unit' meaning one. Nope, the whole army can be in Ambush. The high points of the Commandos are reflecting this. Final word is of course from Matt, but I had the rules written with the above intention. Outlander wrote: So just to be sure, I could say have 4 squads of commandos and have them all ambush and not deploy any of them at the start of the game with the rest of my force? Any British Commando unit can use the Ambush rule. Topic: Starfleet - pdf-File at wargamesvault.com? Re: Starfleet - pdf-File at wargamesvault.com? Re: update 11-06: A.D.Publishing news- Gear Krieg book SALE! Burger wrote: Not really, because if you play at War level, you cannot break down a War into 4 Raid... you only get 3. But in that breakdown, in an 800 point game you could take 4x 200 point ships. Ahh, I see, have to re-read the FAP breakdown! Back on the points values. Wouldn't the following be more in line? That is really funny Adrian, we played Boresight here in Berlin exactly as you mention it.